Bichos Argentinos #14 – Flies! A few miscellaneous fly photos from La Reserva Ecológica Costanera Sur (Buenos Aires, Argentina) taken last March. 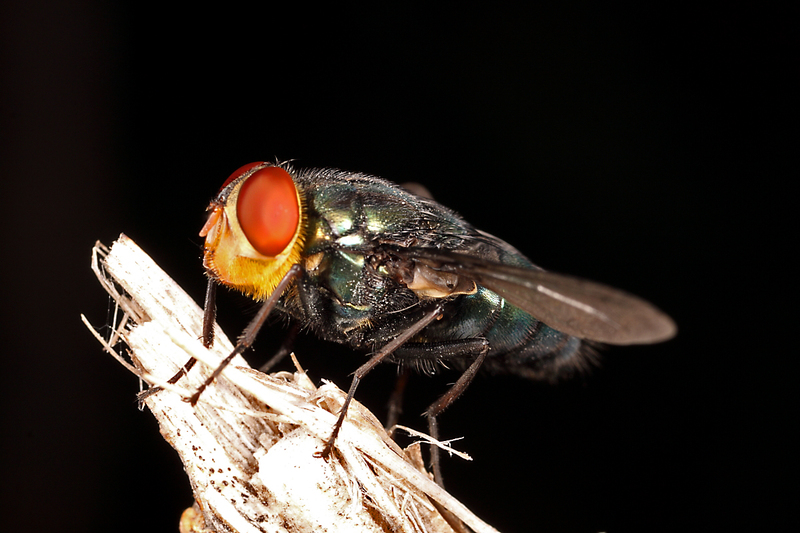 I don’t have IDs except provisionally to family (let’s face it—flies are hard!). 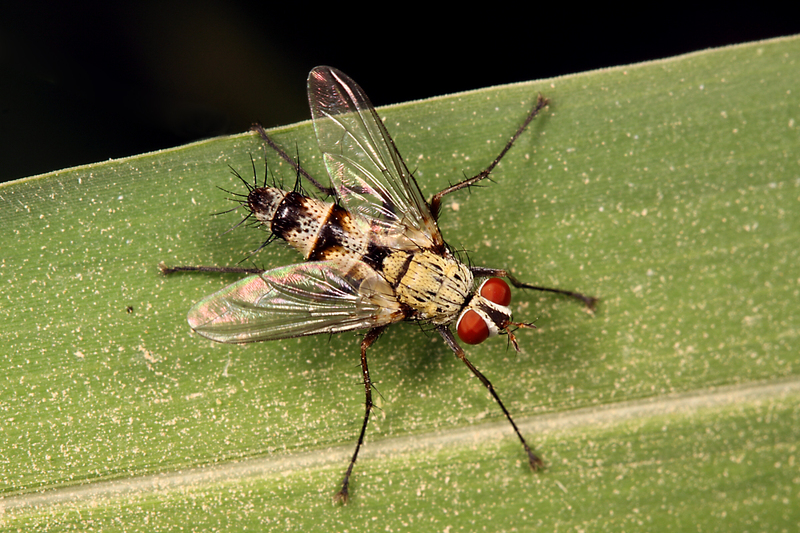 I suppose something in the Tachinidae, based on the black and white striped coloration and distinct abdominal setae. Definitely a robber fly (family Asilidae), but which one? I suppose this is some kind of bottle fly (family Calliphoridae). This entry was posted in Asilidae, Calliphoridae, Diptera, Tachinidae and tagged Argentina, entomology, flies, insects, nature, robber flies, science. Bookmark the permalink. 22 Responses to Bichos Argentinos #14 – Flies! 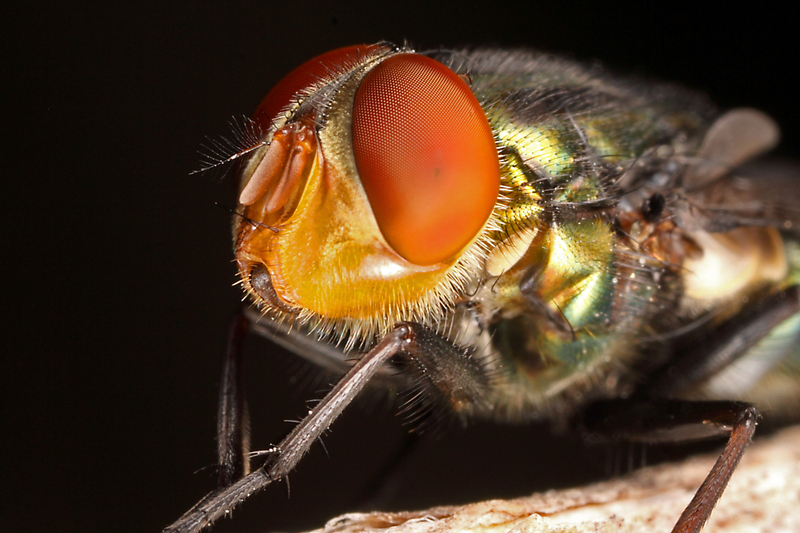 Excellent photography, and I didnt know flies were so colourful. Beautiful photographs. All these flies look so neat and clean! Thank, Ani. It’s funny you say clean, because I was really bugged by the dust particles on them (especially the robber fly). I thought about PS’ing them to clean them up, but there was too much dirt (I did clean the eyes, though). It’s pretty hard to find insects without debris on them. If there’s just a little bit I’ll clean them up, but if it is extensive, or mixed in with setae (making cleanup in PS much more complicated), I’ll just take care of the eyes and be done with it. Man, it’s cross-over Friday apparently… Alex is blogging beetles, you’re blogging flies; I feel like I should do an ant post to complete the triangle! I tried keying each of the flies to subfamily/tribe/genus (your family IDs are correct) and each one got stumped by the wrong angle on the 1st or 2nd couplet… I’m pretty sure the tachinid is in the tribe Dexiini based on the long legs and overall shape, but that’s just a gestalt guess. Great pictures though! One time Alex did a Friday beetle post and I did an ant photo the same day. Crud. Now I’m going to have to come up with a new beetle photo for this Friday! Well, I’ve already got the fly! Ha! I’ve just upped the ante with a rather nice beetle for Friday. A tribute to Eisner. Morgan? Are you following this? Got the messages loud and clear! Better get my dig on and find some killer ants! 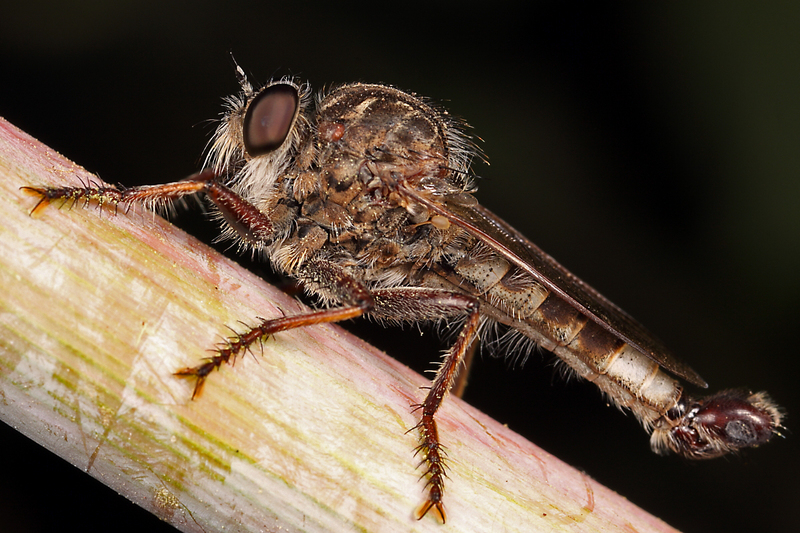 That robber fly is probably belongs to the subfamily asilinae, known as “bearded” or “giant” robber flies depending on the genus. Thanks, Roy – I figured as much, so it’s nice to get a confirming opinion. This one was a little on the small side for the subfamily – reminds me of Efferia. Thank you, Shelly. Hard to pick anything but robbers as the most charismatic group of flies! Tha’s a spiffy tachinid — but then, most of that family are. I only wish there weren’t so much debris on the leaf – a nice, clean, green surface would make a nice backdrop for the striking white/black/red of the fly. The calliphorid appears to be a screwworm fly (Cochliomyia sp. ), maybe C. macellaria. Hi Ben – thanks for the ID.